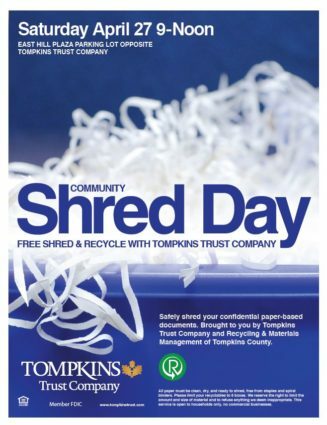 Tompkins Trust Company is offering free annual Community Shred Day on Saturday, April 27th from 9am-Noon in the East Hill Plaza parking lot in Ithaca. Safely shred your confidential paper-based documents. All paper must be clean, dry, and ready to shred, free from staples and spiral binders. Please limit your recyclables to 6 boxes. Tompkins Trust Co reserves the right to limit the amount and size of material and to refuse anything they deem inappropriate. This service is open to households only, no commercial businesses.